September 29, 2015 By This post may contain affiliate links. 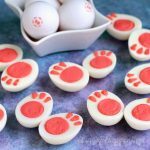 These cute Halloween treats are sure to appeal to adults and kids alike. Each decadent Chocolate Candy Corn Truffle has a yellow, orange, and white candy shell filled with luscious chocolate ganache. This post is brought to you by Wilton. Halloween is the perfect time of year to make a candy corn style treat, but I know many people hate the flavor of the iconic holiday candy, so today I’m mixing things up a bit. 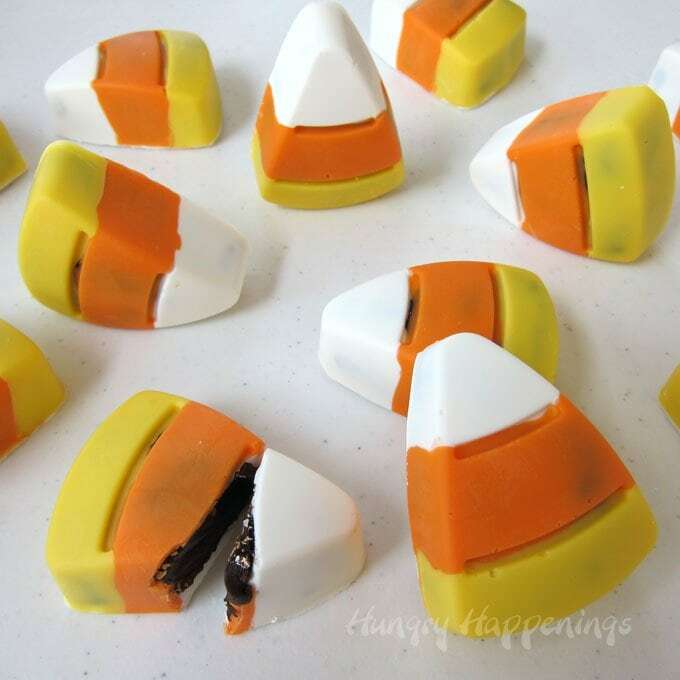 I took a decadent chocolate treat and turned it into candy corn. Well, something that looks like candy corn, anyway. I filled mine with a plain chocolate ganache, but there are so many wonderful flavors you can use instead. Check out these recipes to make Chocolate Hazelnut Coffee Ganache, White Chocolate Amaretto Raisin Ganache, Pumpkin Ganache, or Chocolate Raspberry Ganache filled Candy Corn Truffles. Candy corn shaped chocolate truffles decorated with cute Jack-O-Lantern faces. 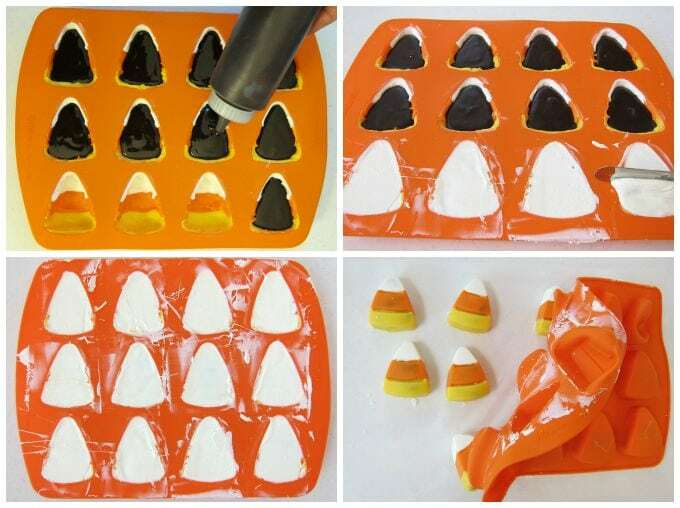 Paint yellow, orange and white sections in each candy corn mold. After painting each color freeze for 3 minutes, then allow mold to come to room temperature before painting next color. To make the chocolate ganache, heat the heavy whipping cream until it just starts to bubble around the edges of the pan. Pour over the finely chopped semi-sweet chocolate and let sit for 3 minutes. If not all melted, heat for 10 second increments, stirring after each until melted. Allow to cool until no longer hot to the touch. Pour the chocolate ganache into a squeeze bottle. Pipe into the candy corn molds filling to 1/16th of an inch from the top of the mold. Allow chocolate ganache to firm up for several hours or overnight. Pour melted white candy melts over ganache. Pop in freezer for 5 minutes. 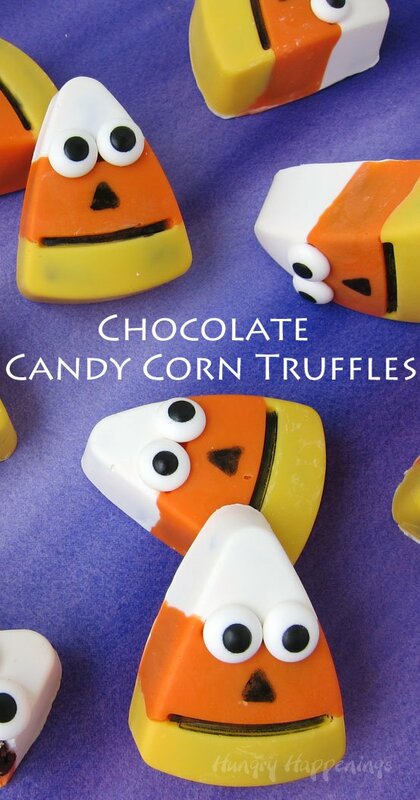 If using, attach two candy eyes to each candy corn truffle using a dab of candy melts. Draw on a nose and mouth using a black candy melts writer. 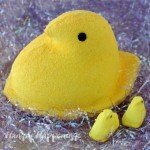 Whenever I am painting molds with candy coating (Candy Melts) I find it easiest to create a water bath in an electric skillet and set small jars or bowls of the melted candy coating in the water (being sure no water ever gets in the candy coating.) I can work for hours and not ever have to run to the microwave to remelt my candy. It’s a huge time saver. You can melt the candy coating in the microwave before putting it in the skillet or simply place the wafers in the jars in the skillet and allow the warm water to heat them until melted. Then you can paint the candy coating, using food use only paint brushes. Paint one color at a time, then pop the mold in the freezer for a few minutes so the candy coating hardens. Remove the mold and allow it to come up to room temperature before painting the next color. Be sure to paint the sides of the mold and completely cover the grooved lines that create the space between the colors, otherwise you’ll have holes in your candies. 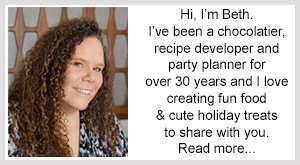 For really detailed instructions on how to use an electric skillet to melt the candy melts and how to paint the candy melts into a mold, see my Chocolate Making Tips page. 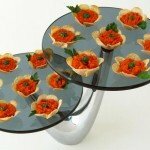 Once the candy mold has been painted, you can fill the mold with the chocolate ganache of your choice. 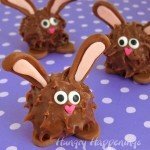 Make sure the ganache is not hot when you pour it into the candy shells. Allow it to cool just enough that it is only slightly warm but is still thin enough to easily pour. I love puting the chocolate ganache into a squeeze bottle then piping it into the mold. It makes filling the molds super easy. You’ll want to fill the mold to about 1/16th of an inch from the top. Allow the ganache to firm up for several hours or overnight. 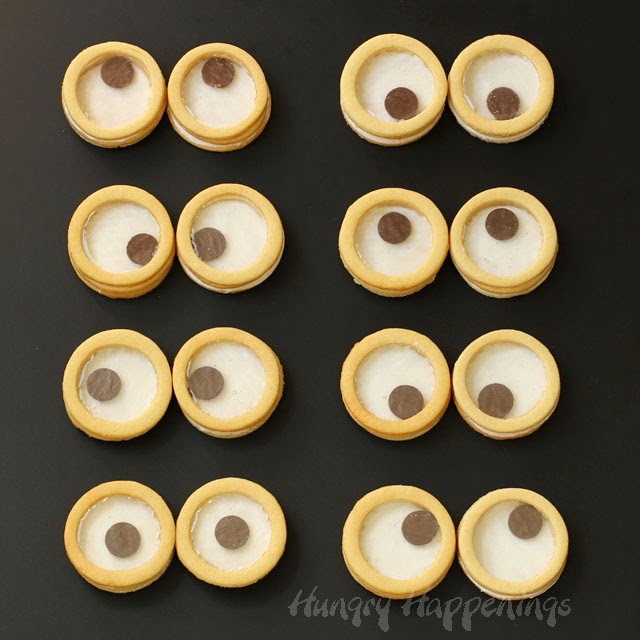 If you are in a hurry, you can refrigerate the ganache until firm, just be sure you remove the mold and let it sit until the mold and the ganache have come to room temperature, otherwise it will become challenging to spread the candy melts over top before they harden. Next, spoon some white candy melts over top of the ganache, spread it around, then scrape off the excess using a small metal spatula. Once you’ve covered all the truffles, pop the mold in the freezer for 5 minutes. Then remove and un-mold the candies. Allow the truffles to come to room temperature, then if needed, use a sharp knife to cut off any excess candy from around the edges of the candy corn. 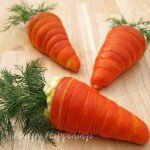 When the chocolates come out of the mold, they look like candy corn and can be served just as they are, but you can have some fun by turning them into Jack-O-Lanterns. 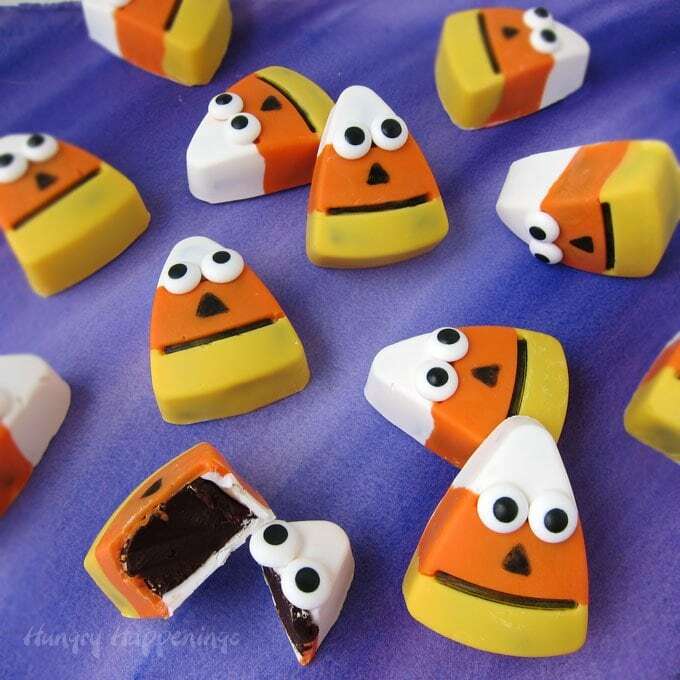 Just use a dab of candy melts to attach two large candy eyes to each candy corn. Then use a Wilton Candy Decorating Pen to draw on a nose. The line between the yellow and orange creates a mouth. Leave it as it is or fill it in with black marker. I like them with the mouths drawn on, but either way, they look pretty cute. These Chocolate Candy Corn Truffles will keep stored in an airtight container for up to two weeks. 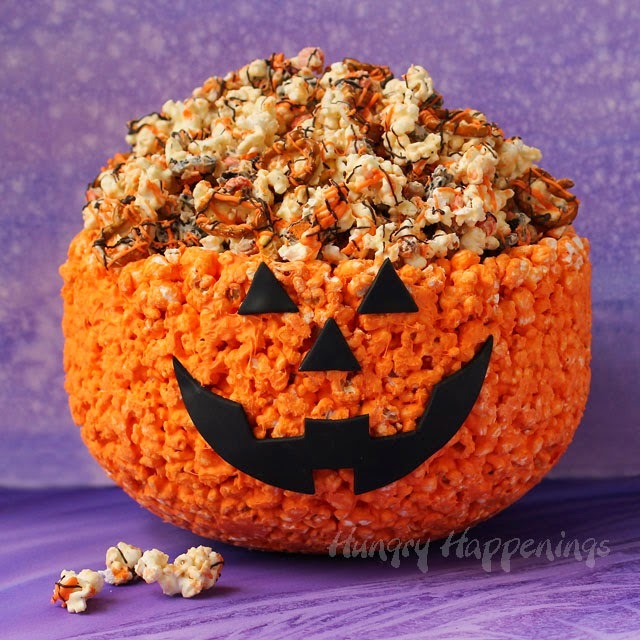 Check out all the fun Halloween Treats from Hungry Happenings, here. I love teaching kids how to paint chocolates. They really love it! These would be easy for kids to paint. The design is so simple. I hope you all have fun! 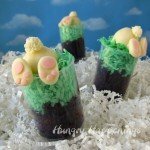 The mold is a great size for so many treats. I’m sure you will find something amazing to do with it! Have fun. Oh my candy corn cuteness – I would surely eat these by the handful with the center full of chocolate!